Lord of the Dance….or a Modern-Day Nero? 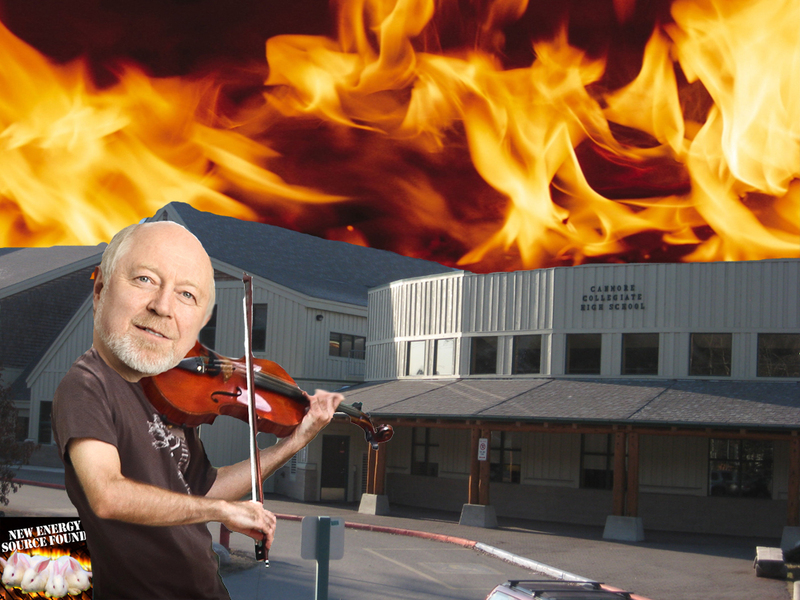 “Why You Can’t Get An Arts Education In Canmore” tells the story of the beginning of this dive into the muck and mess that is our current educational system. My diagnosis at this point? It’s broken. There are some short-term solutions. I have offered to go in and assist with teaching drama and art at the school for those that want it, although I’m very concerned that at this late stage in the game, that’s not going to be the game-changer here. Students are getting comfy with their schedules, social issues and highschool is pressure enough as many of us can attest. Still, I’m willing to do what I can. The importance of an arts education, accessible by all in order to create well-rounded, creative thinkers that can tackle the complex issues of the future and provide innovative solutions. Creative Solutions!…. if we can get past making decisions at all levels based on the “rules” and start basing them on the values we hold. Even though the system is broken, we can fix it. WE. Not partisan party politics, not individuals. WE. It’s complex, but understandable and when things are at their most “broken”, it offers opportunity to really get in there, get rid of what’s causing the problem(s), innovate and create something new. In order to do this, we need everyone at the table, with a willing attitude, throwing out the excuses, cynicism and rhetoric, and believing it can be done – on any subject or problem that is important to us. 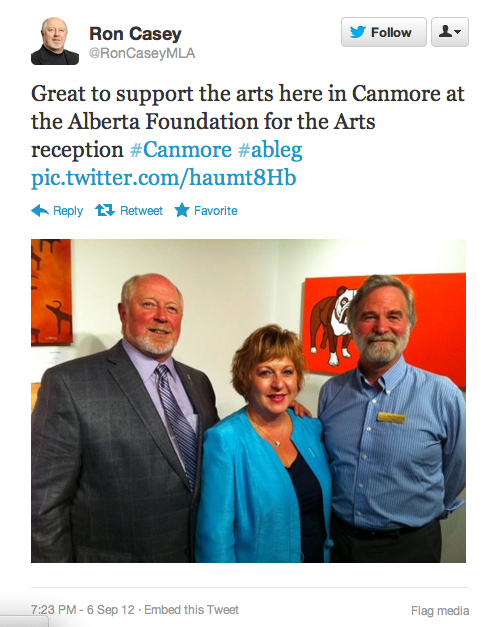 I haven’t, however….heard a thing from the former Mayor of Canmore and new MLA in Banff/Cochrane which does surprise me, since he touts that he’s such a big supporter of the arts. 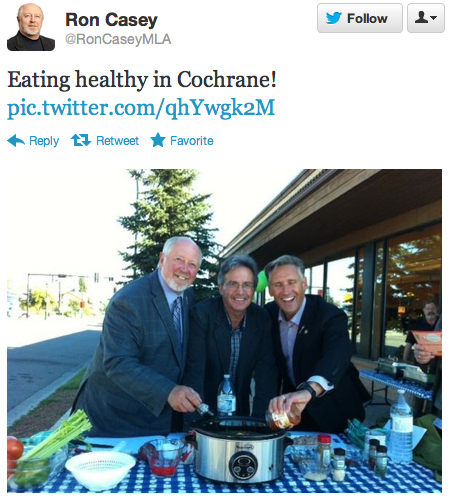 I did hear, though….that he was ever so busy attending a soiree at a local gallery to fete the Minister of Culture and the AFA (Alberta Federation of the Arts) Board. Don’t even get me started on that one. Yes, that’s how I like to see my tax dollars spent! CELEBRATING!!! WOO HOO….party on!!!! I know we’re all busy, but isn’t it his JOB to respond to the concerns of his constituents? I’ve had other MLA’s and their offices from OTHER ridings across Alberta call me to express concern and enquire….but I think the Ronster is busy. Not even a PEEP or a TWEET from a constituency assistant or from His Worship. Doesn’t he look smashing and dapper in this Don Cherry lookalike purple tie and suit? Kudos. That’s ARTSY. He’s partying with the artists and tasting food today. That’s okay…I’m not going away. I want to see this FIXED. I wonder if it’s rabbit stew in that slow-cooker? Good news! Just received an email from Lesley Bannister. I love it when folks start to work….Perhaps proof positive that blogging and social media are the fastest way to effect change? Blogpost was originally published at 10:11 am…some action within two hours, 7 minutes and 5 seconds. Of course, the first letter was sent days ago. Just throwing it out there. I’m hopeful, if folks can come to the table. Thank you for your comments regarding school fees and scheduling conflicts at Canmore Collegiate. I will be discussing your issues further with Mr. Casey this afternoon in order to better direct your inquiries.